Back when we announced the GoDaddy acquisition, a lot of you were surprised. A lot more were concerned about the future of our service. Now it’s time to talk what we’ve been quietly working these past few months. No, it’s not a space octopus that devours your opponent’s websites; that’s on the 2018 road map. But a bit of context first. Our goal has always been to make your life easier by giving you rock solid tools and making sure you don’t waste your time on trivial tasks that could be automated. We wanted a better hosting integration. A more secure transfer of client credentials. A way to provide you with business leads. Hiqh quality training and certification. All this and more require experience, funding and the manpower we didn’t have. That’s why it made total sense to team up with GoDaddy: we had the reliable and intuitive way to manage multiple websites, and they have everything else – hosting, training, business leads, the whole shebang. So we joined them and started working with them on relaunching the Pro program. Simply put, GoDaddy Pro helps web developers and designers manage and grow their business from one place. It’s a family of tools that make your life easier. If you’re reading this, then you probably already know how ManageWP works. The Pro ManageWP version is essentially the same: all your websites are connected to one dashboard, and you can manage them efficiently from one place. 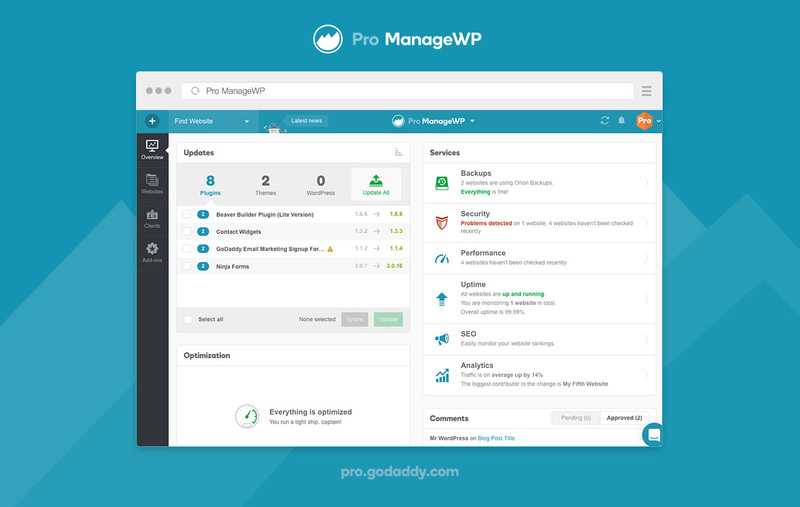 The one major benefit over the regular ManageWP is that you can deploy new GoDaddy-hosted websites from the Pro ManageWP dashboard. The Clients tool is building on what ManageWP has been doing in the past 6 months. It lets you manage your client’s DNS, emails and hosting configuration. Most importantly, it lets you buy products for your clients, or you can just send the shopping cart to your client and automatically gain access once the purchase has been made. The Rewards program keeps funneling back to you the money your clients are spending in the form of in-store credit and special discounts for Pros. GoDaddy has 14 million small & medium businesses. These businesses could use your help. 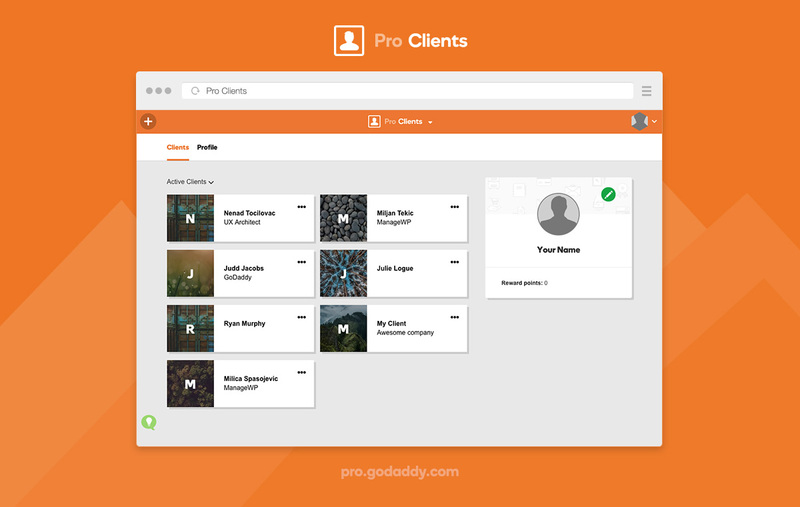 That’s why you can use the Pro Connect directory to get listed and get new client referrals. If you want to find out more, check out the GoDaddy Pro website. But right now I’d rather talk about what the Pro launch means for you as a ManageWP user. The feature set is the same, with one minor Pro benefit of being able to deploy new GoDaddy-hosted websites. Both dashboards work fully with virtually every host on the market (yep, you can manage Dreamhost, WP Engine or any other website on both dashboards). Starting December 1, these 2 premium add-ons are free for websites hosted on GoDaddy servers, on both regular ManageWP and Pro ManageWP. This improvement is applied automatically, and if you’ve got websites on any GoDaddy hosting, you should see that you’re no longer paying for these add-ons. Should I Switch to Pro ManageWP? That’s entirely up to you. We just want to make your life easier, so you could focus on more important matters. If you see the benefit in joining the Pro program, by all means switch. You’ll be given the option of linking your existing ManageWP account, so you keep your history, websites, tags, etc. 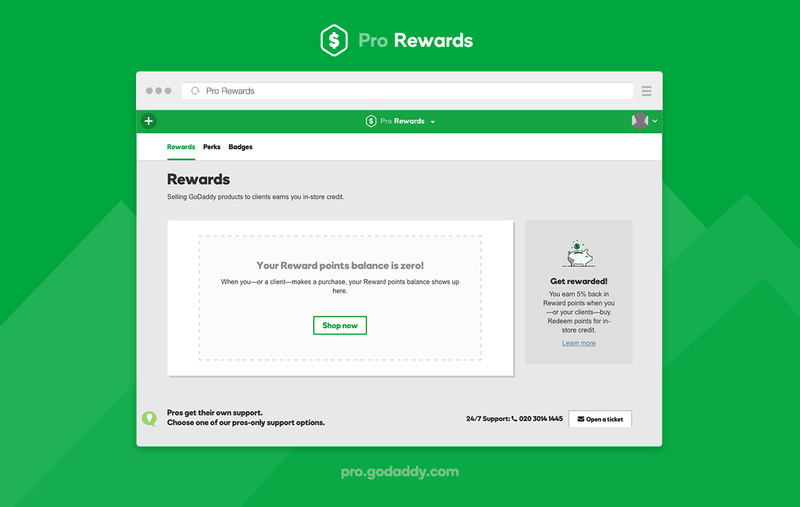 Have a look at this thread and find out more about the Pro program, the future of ManageWP, and other GoDaddy projects. Next blogpost:AMA Season 3 Highlights! I have 6 sites that I am managing with ManageWP and 5 of them show the godaddy host tag but one does not. All 6 sites are hosted on GoDaddy. The site that does not show the tag also is missing information from the system info tab in the ManageWP dashboard. The site having the problems is the only site I have that is running SSL so I am wondering if that is the problem. Its just odd because it is showing that it is connected. The SSL should not be the cause of this, but we definitely want to look more into this. Could you open a support ticket so we could investigate? I see that you’re using the Pro ManageWP, that one has the dropdown menu if you have existing GoDaddy websites on your Pro account. If you don’t (or click the “other domains” link), you get the regular prompt. Those that stay on the standalone ManageWP, they just get the regular prompt. How can I get back to the standalone? I’ve got 5 clients on GoDaddy for now until I move them off to a more stable and faster hosting platform. At the moment you can’t, but we’ll probably build a way to decouple the accounts at the start of 2017. Please do, the less I can see of GoDaddy the better. Is it any coincidence I woke up to this news and 2 of my clients Managed WP sites with GoDaddy are down? Was it indeed a downtime or just a false positive on Uptime Monitor? I wish it was conspiracy. Unfortunately sites down for 2 hours with no notification from GD support on time down or est. time to resolve. Another couple hours and I would have recommended clients to move to another host provider with responsive and responsible support. Always a roll of the dice with GoDaddy. What if I have a VPS with GoDaddy with lots of sites? Does that count as GoDaddy hosted sites? It counts – it doesn’t matter which package, as long as the websites are on GoDaddy servers. I am guessing the pricing models would be the same? For instance I have the 100 site bundle for everything, If I switched the billing would remain the same? Even if I have 10 GoDaddy sites or zero? That’s correct, the pricing model is the same, and you’ll have the same monthly bill no matter which option you take. And regarding the bundle question, let’s say you have a Backup bundle for 100 websites, and you’ve got 10 GoDaddy sites and another 90 hosted elsewhere. Now with the backup being free for GoDaddy websites, you’ll still pay the same bundle fee (because it’s a bundle), but you’ll have 10 extra backup slots for new non-GoDaddy websites.